I'm struggling with what this blog should be. Actually if I'm honest with myself I know what I want this blog to be, but I'm struggling with whether or not it is the professional thing to do. I want a business and I have a business. This is my blog that goes with that business. 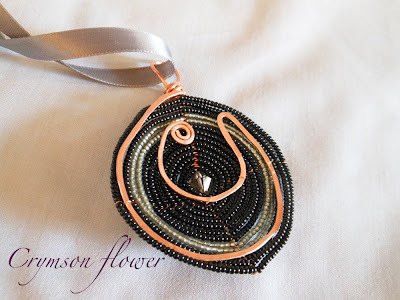 And hence only business related things should be on the blog. And I should come off as I know everything about business and where I'm going with everything. The blogs I like most and read most are about people. The people behind the business, their struggles and their success's. That is honest and that is what is natural for me to blog about. If I try and do anything different that what I feel naturally to blog about I just won't blog. So here we go. I've spent this week in a bit of a funk. That's ok...I realize funk's happen. The important part is getting out of the funk. The last two night's I've surrounded myself with tons of color and beads. 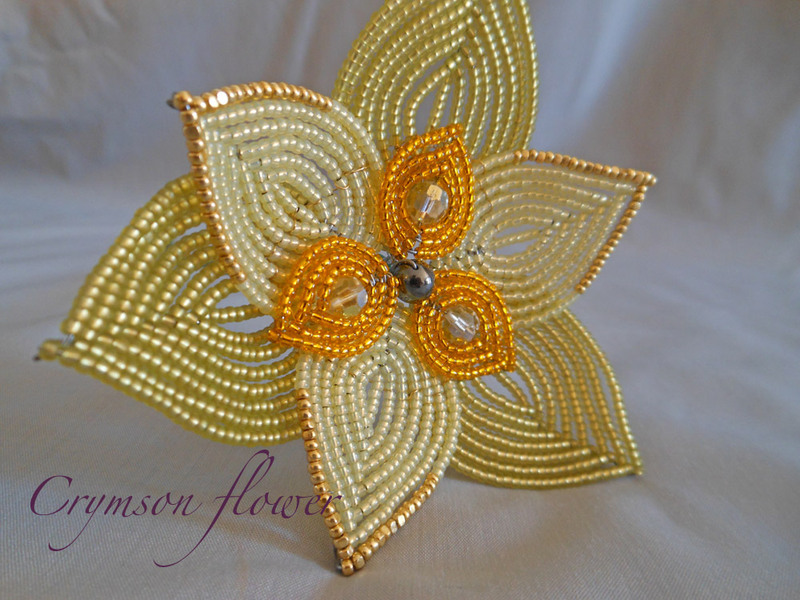 And I found myself drawn to making flowers. 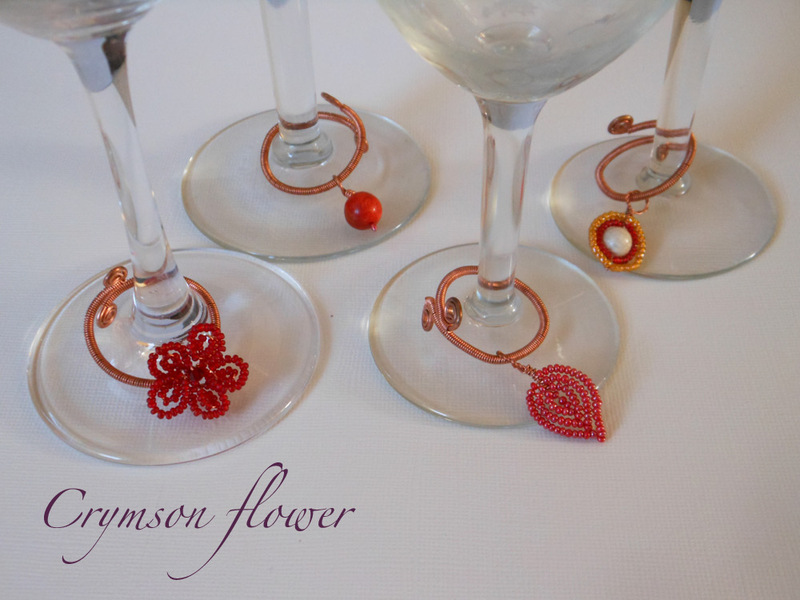 As much as I really tried to focus on wine charms flowers are what I was coming up with. 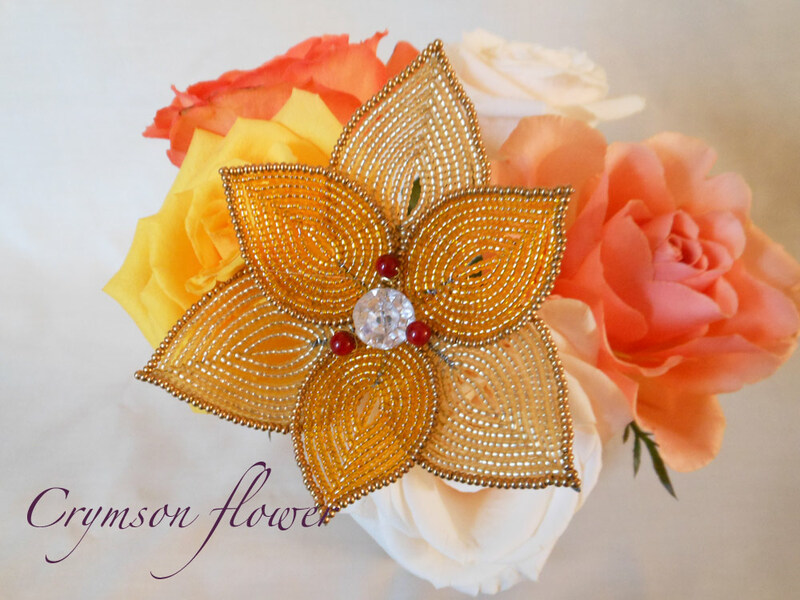 I can't wait for the next sunny day to show off these new creations. 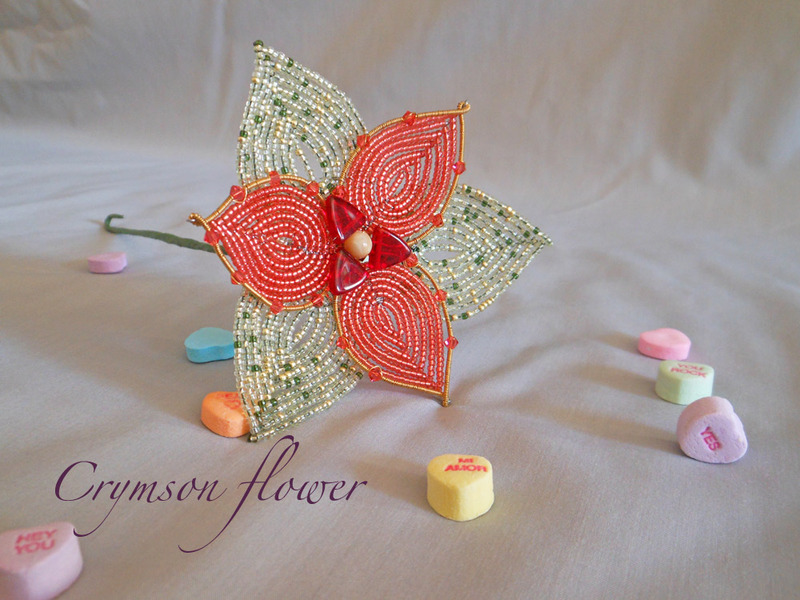 I've also spent a lot of time reading up on etsy shop marketing and tips and tricks of etsy. It's completely overwhelming. But I've made a list and I'm mentally writing up my about page and thinking of key words to add into different places around the shop. It is forward progress and that feels good. 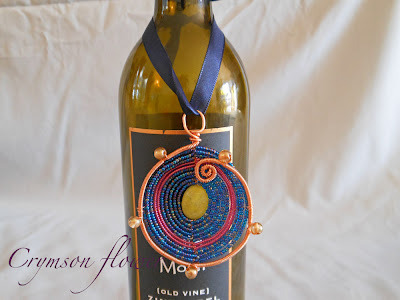 There are a couple new wine pendants in the shop and they are incredible. 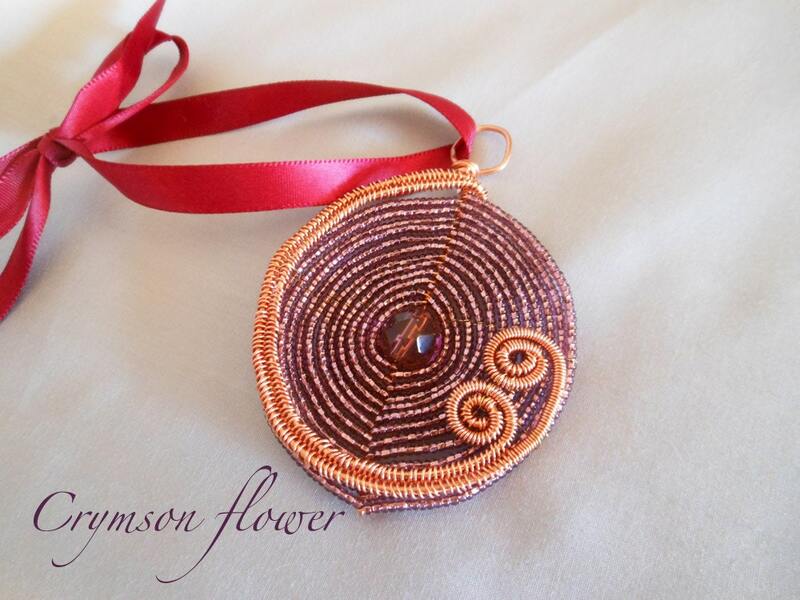 The violet copper one let me go back to weaving with wire and has opened up some doors that I didn't think would ever open back up. I LOVE wire. 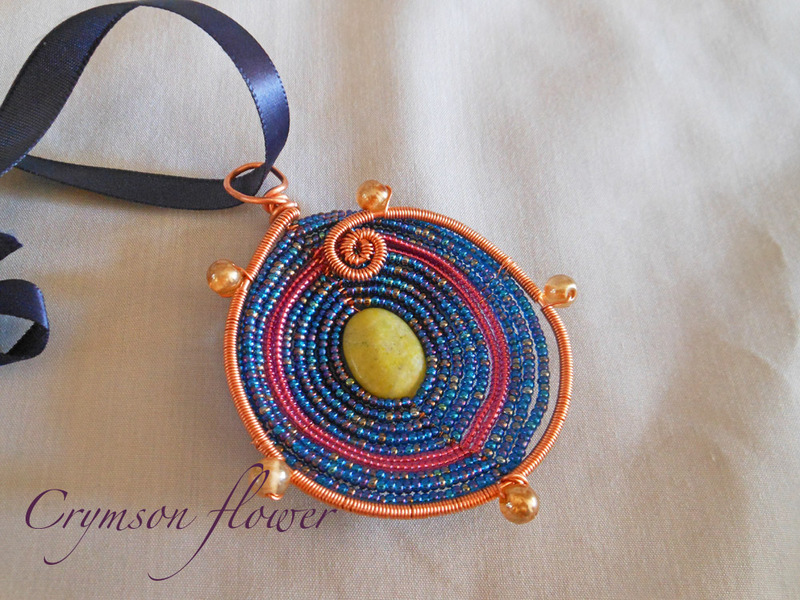 I loved weaving it. And I hope ot explore more with this discovery. 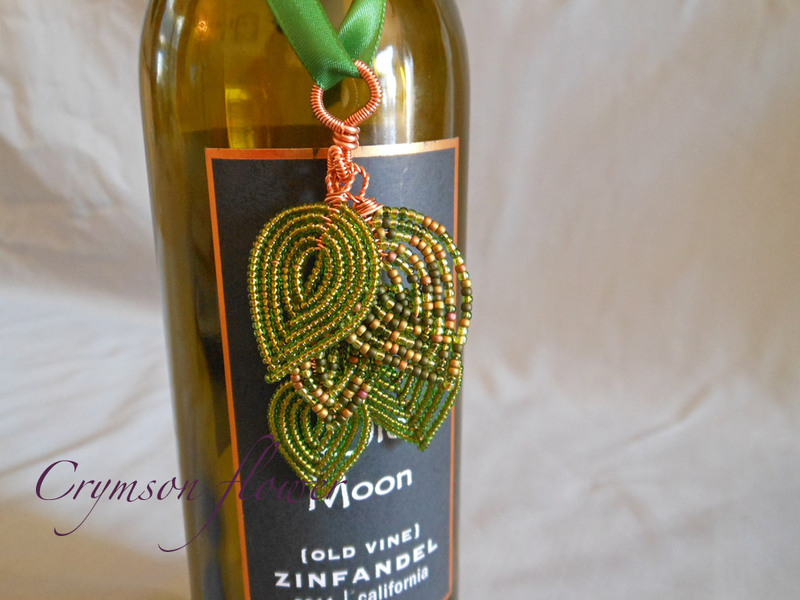 The second wine bottle pendant is subtle in color, but elegant on that wine bottle. The faceted glass beads amongst the wire really sparkle. I mean really sparkle. It's really very pretty. This weekend we were in Chicago for my mother in law's 60th birthday party. Two nights and two parties later we are home and unpacked. It's good to be home in a quiet house. Hopefully this nap R is taking will help put him back on his schedule so that he's not too grouchy this evening. In a few hours we'll be in yet another party with my friends coming over to watch the Oscars. 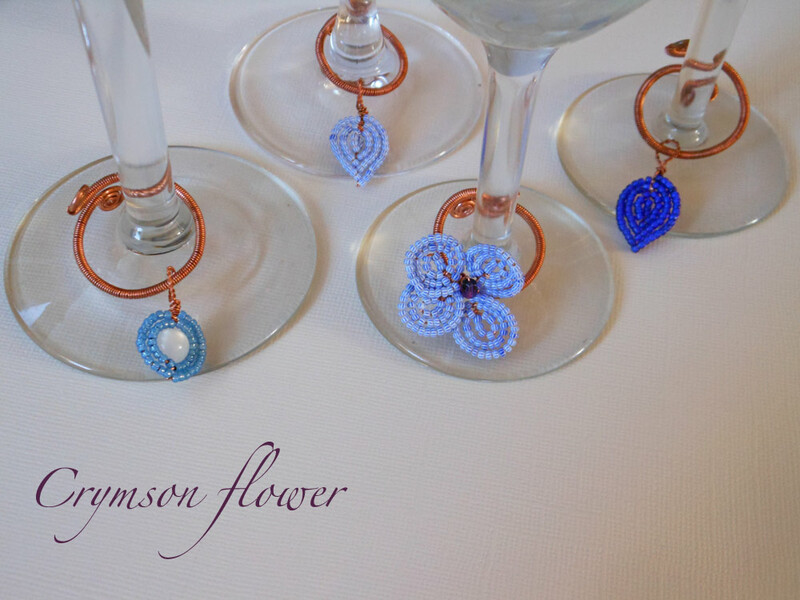 I'm looking forward to it but I'm also looking forward to working on Crymson Flower. When things got quiet this afternoon I took out my notebook and made a giant to do list for the month of March. I'm really excited about the things on this list. It includes everything from buying a binder to keep my paperwork organized to what I want to make to add to the shop. 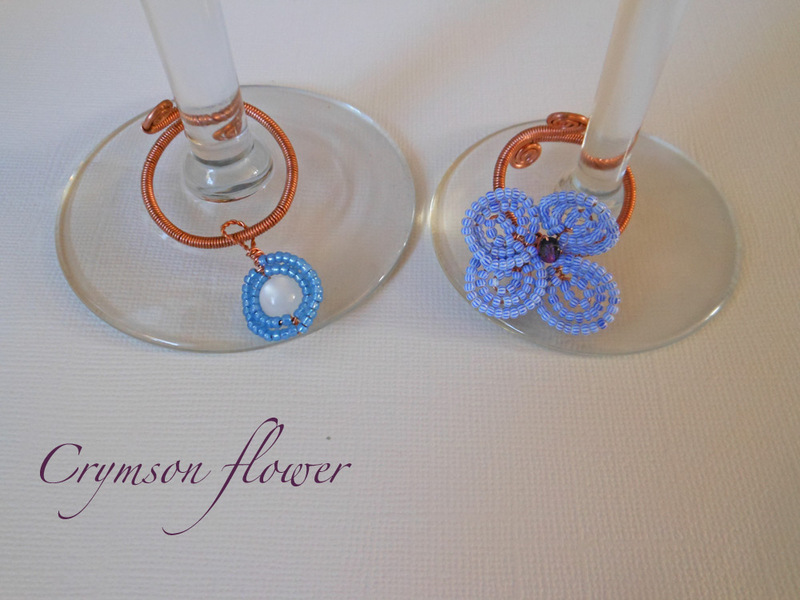 More wine charms, and flowers mostly....but different styles and colors. Let's bring spring the to Crymson Flower! at least that's what's in my head right now. This coming week will bring more wine bottle pendants to the shop. I have some awesome shamrocks to show you for St. Patrick's day that is right around the corner. An amazing miracle happened this month. Somehow between all the time I've spent on here and on etsy I also managed to finish the quilt for my mother in law's party. I think she loved it. There was a big smile on her face from what I saw. Of course R had to go potty right at that moment and insisted I take him. I had taken an personal day and turned the dining and living rooms into a quilting studio. I am very proud of how this quilt turned out. It was the best job I've done with both basting and quilting. And it was kinda fun to quilt it. I have made the final decision that I will not cross lines while quilting. Bad things happen when I attempt that. It was a small issue and I was able to easily fix it. For as much as I really disliked sewing this quilt, I really love how it turned out. And she does too. I was proud to be able to give it as a good gift. No more big quilts for me for a while. At least nothing with a two month deadline. Have I told you how much I'm loving making these wine bottle pendants. I have so many ideas and not enough hands. I have design ideas. I want to explore the leaf idea and expand on it. 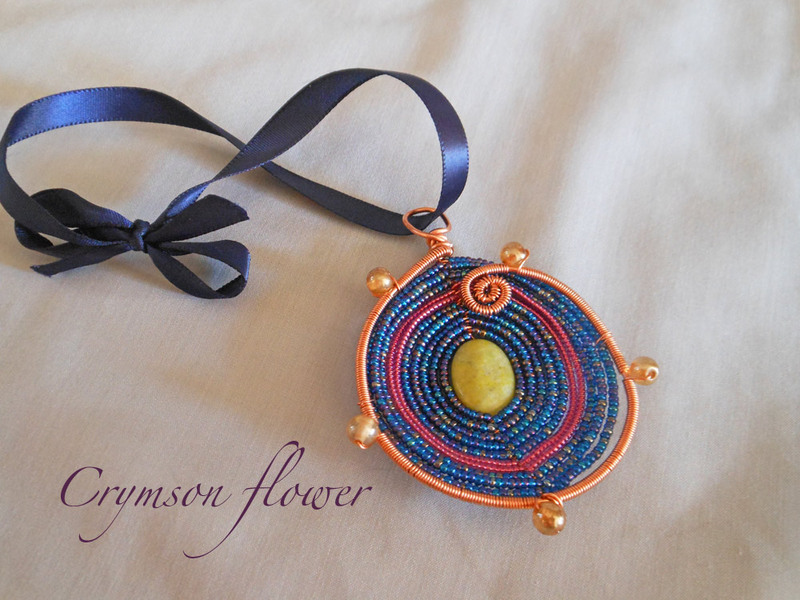 I have a leaf pendant pictured below and how cool would it be to go different colors. Rain drops dangling, or pink petals falling, or even play on a bunch of grapes. There's room to grow. 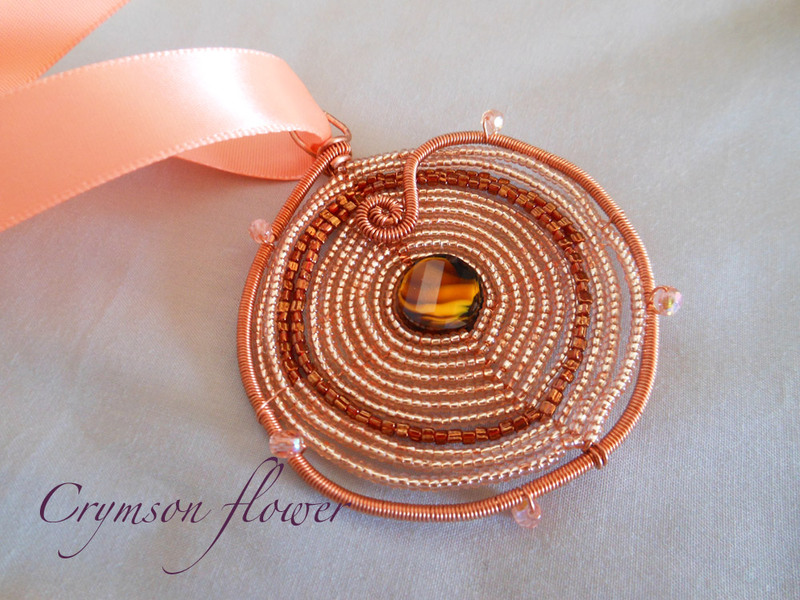 I want to expand on the wire accents. 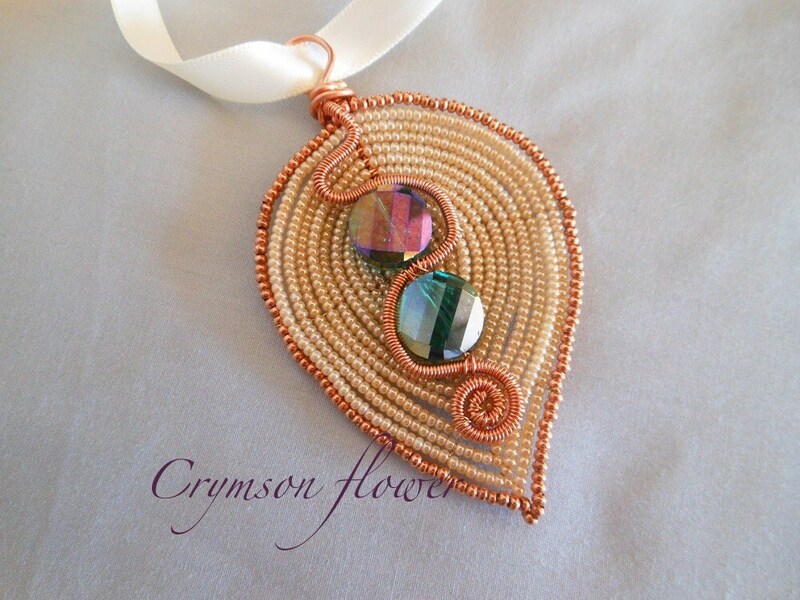 I love wire wrapping right now, and using it to enhance a simple tear drop shape makes me happy. I want to work on these skills and get more complex in the techniques. 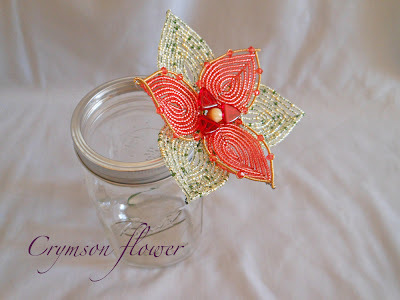 I want to bring more wire into actual flowers. And see where that takes me. So many ideas and not enough hands, eyes, and brains to get everything done. But that seems to be a common complaint among the creative at heart. It feels good to be brimming with ideas. I hope you are as excited to see what comes next as I am. 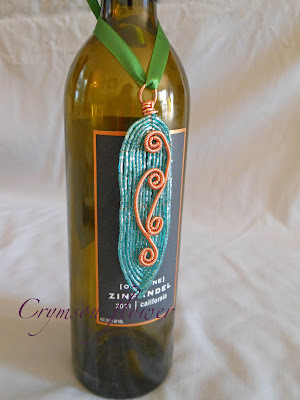 For now there will be plenty of wine bottle pendants. Get ready for some wine bottle love. Have you ever hosted an Oscars party? ok let me back up...did you realize that the Academy Awards is this Sunday! It sort of snuck up on me this year. I don't usually do anything big for the Oscars. For the past three years I've Skyped with my bestie, M during the show. It gives us an excuse to drink wine together and catch up in between awards. This year she'll be in town and I'm super excited. This means the party's at my place this year. We'll start early to catch the red carpet. We'll order out from local eateries and drink lots of wine. She suggested we place bets on who will win each category and whoever gets the most right wins a prize. We haven't hammered out all the details of what that prize might be. Probaby just the left over food. It's still going to be a lot of fun. I'm going to take the opportunity to do some new product testing that night. I have a few new items I'm wanting to add to the Crymson Flower's inventory. This will be the perfect opportunity to test them out. See how other wine lovers like them. And really it's just fun to bring some color to the party. Here's a sneak peak of some of what I plan to bring out. And I'll post party pic's next week. What are you up to for the Academy Awards? See anything above you're excited to see in the shop? Who do you think is going to wear the best dress? or you know win the big awards? It's that holiday. The one we all know about, and celebrated every year for the first 10 years of our life or until the 6th grade when the class room finally gave up the V-day parties. Some people love it, others dispise it. It really is what it is. To me I think it's kinda fun. An excuse to buy lobster and steak and cook a surf and turf meal for the hubby. But this was the first year in ages that we actually did something. And really the meal was yesterday. In a little bit I'll celebrate w/ my son at his daycare with all his sugar high buddies. 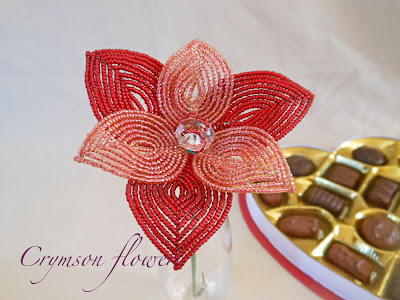 To me Valentine's is just an excuse, a little nudge to tell your someone that you love them. Maybe a little nudge to tell yourself how much you love you. There's nothing wrong with treating yourself. In fact that might be more fun b/c at least you know you're going to love what you get. Here's a few of my most Valentiney gift ideas. Lately I've been brainstorming ideas for fun new wine accessories. 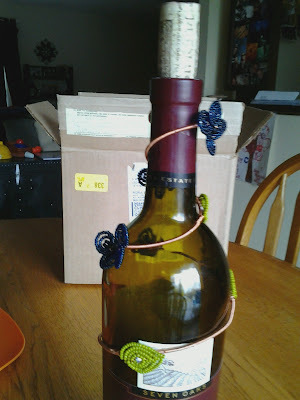 Yes, I love my wine and I love it even more when it's blinged up with some beads. 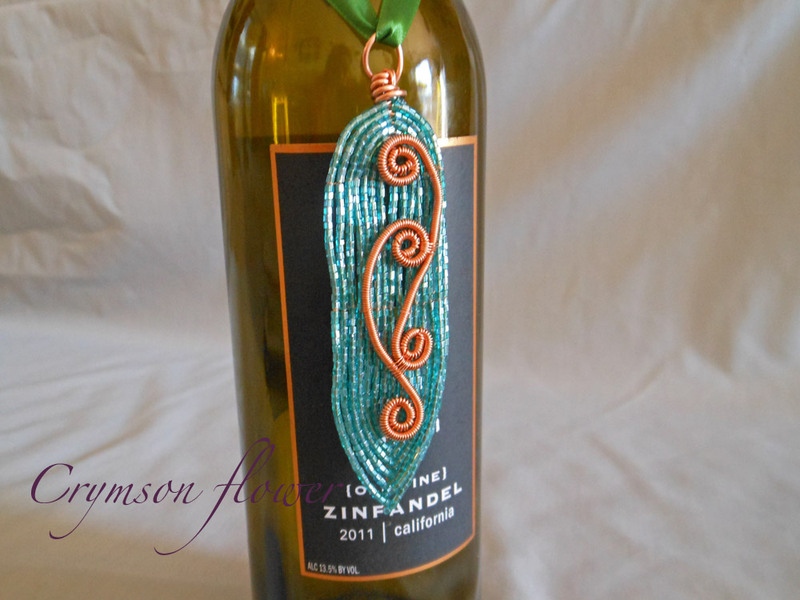 That's when I came up with this idea for a wine bottle pendant. A fun hand beaded, wire wrapped, pendant hung around the bottle of wine you choose to bring to that fancy dinner party or housewarming party. It's a little piece of art that doesn't take away from the wonderful wine but will still be there after the wine is long gone. What do you think? 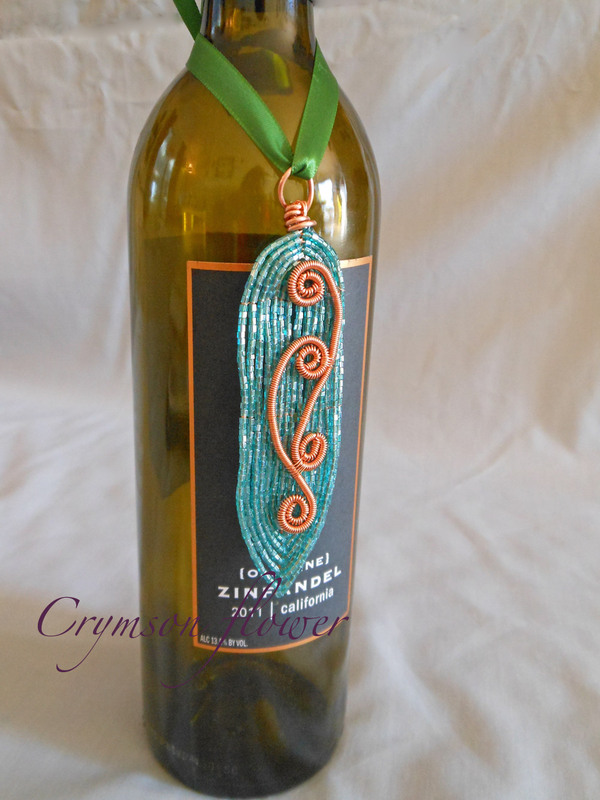 Would you use it to decorate your next bottle at your dinner party? Or give it away with a nice bottle of Cabernet Sauvignon? What's there really to say about this flower other than it's bright, and happy, and very spring like. 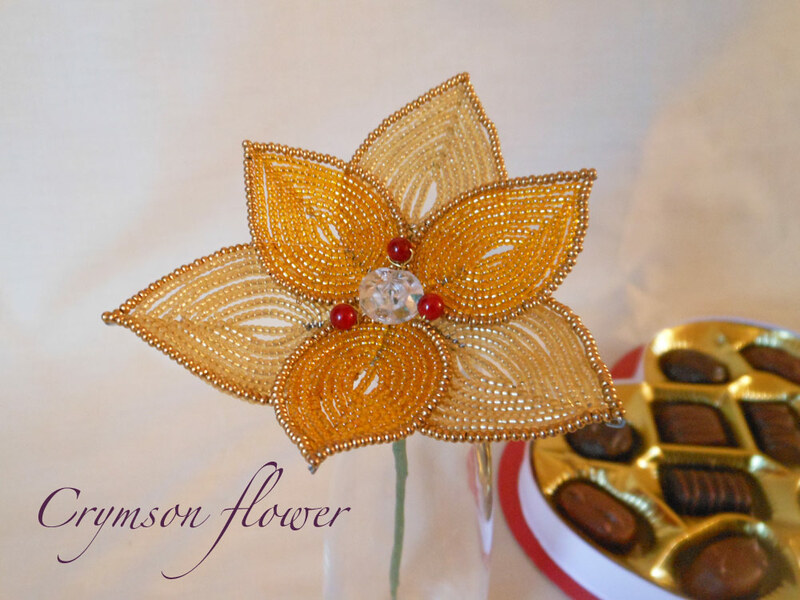 It looks fabulous with a bouquet of roses or baby's breath but imagine how wondrous this flower would look in a bouquet of daffodils. I'm loving this listing something every day thing. It's fun to just make it happen. Exciting things are going on. 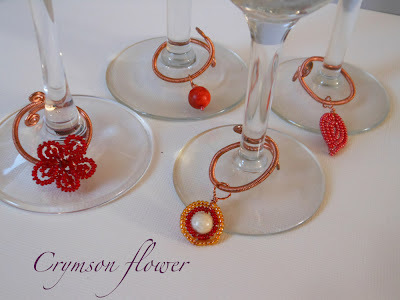 I just received my box of boxes so now I can list some more delicate wine charms in the shop soon. Tomorrow is supposed to be sunny so that will be a photography day. I have my first commission I'm super excited about and I'll work on that this weekend. And somewhere in the next week I need to sew the binding on that quilt. Lots to do and I'm loving all of it. Hope everyone else out there is enjoying their weeks. It's going to be a big week here at Crymson Flower. I made a list this weekend...a to do list. Which means I've put all my ducks in a row for the moment and am full steam ahead. Step one on my list is to get everything I have completed and ready to go in the shop. 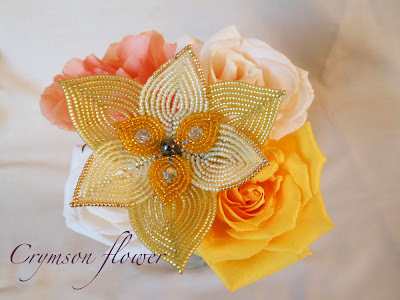 I will be listing a new item every day this week, so check back daily to see what's new. Today's listing is this golden beauty. 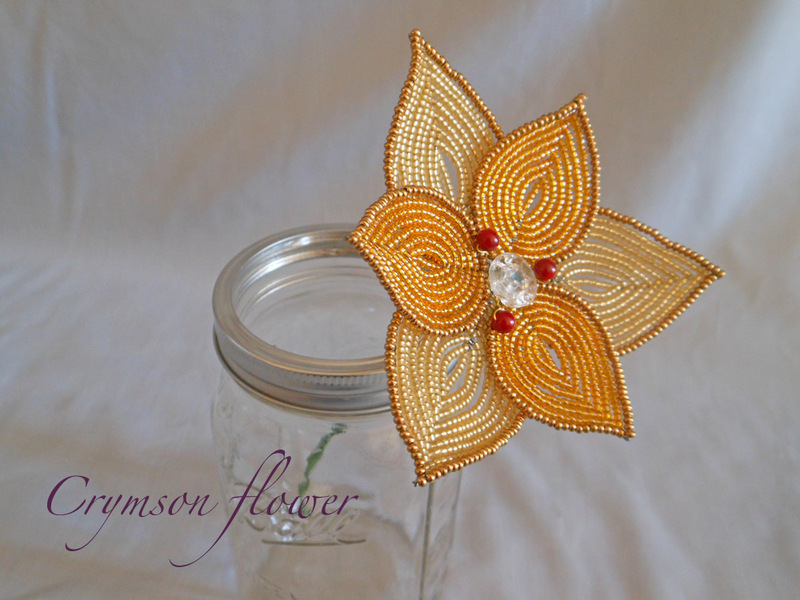 Something about the combination of gold seed beads and brass outlining beads really makes this flower glow. 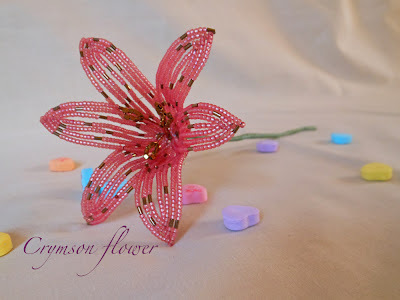 It's a rather simple flower so it can be dressed up a bit with some fresh flowers, but really it looks great solo too. 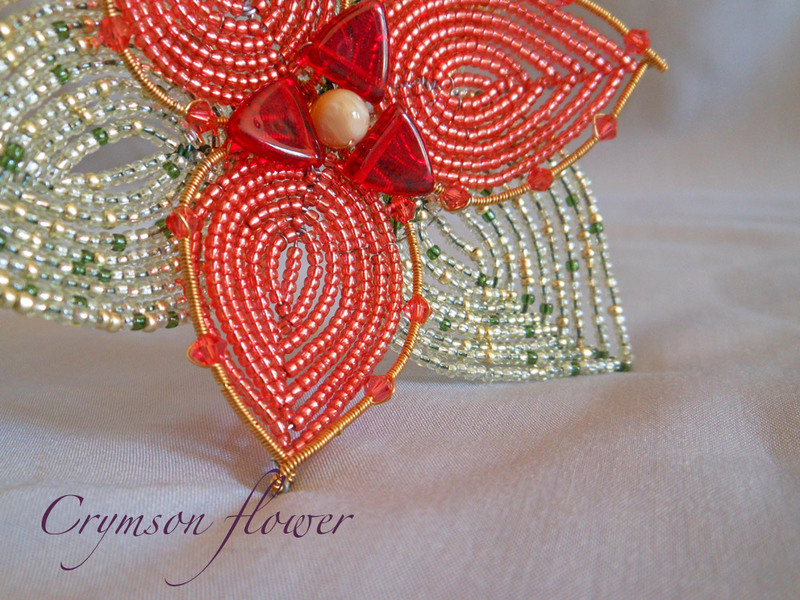 The center is a vintage glass faceted button surrounded by three red glass beads. 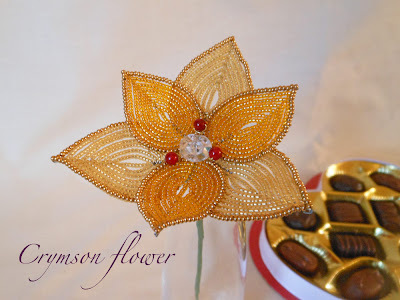 Simple and gorgeous. 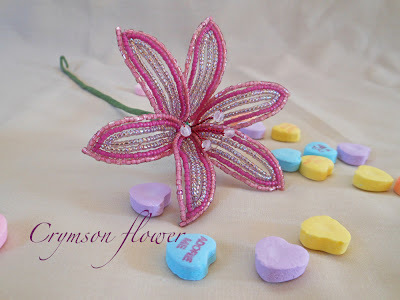 Valentine's Day is fast approaching and I've sort of dropped the ball in what I planned to be a bombardment of posts on why beaded flowers make excellent Valentine gifts. 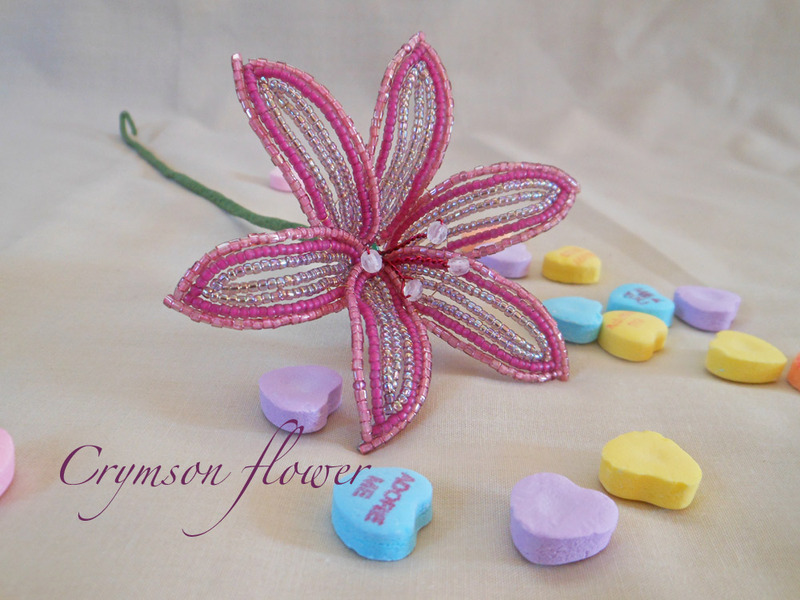 Beaded flowers can make a normal bouquet of flowers really special. 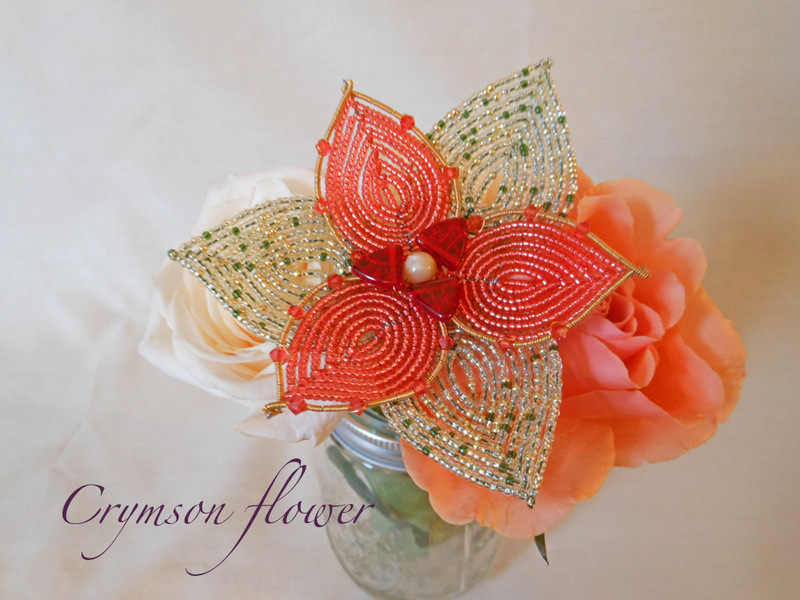 Where fresh flowers wither and fade beaded flowers will literally last a life time. 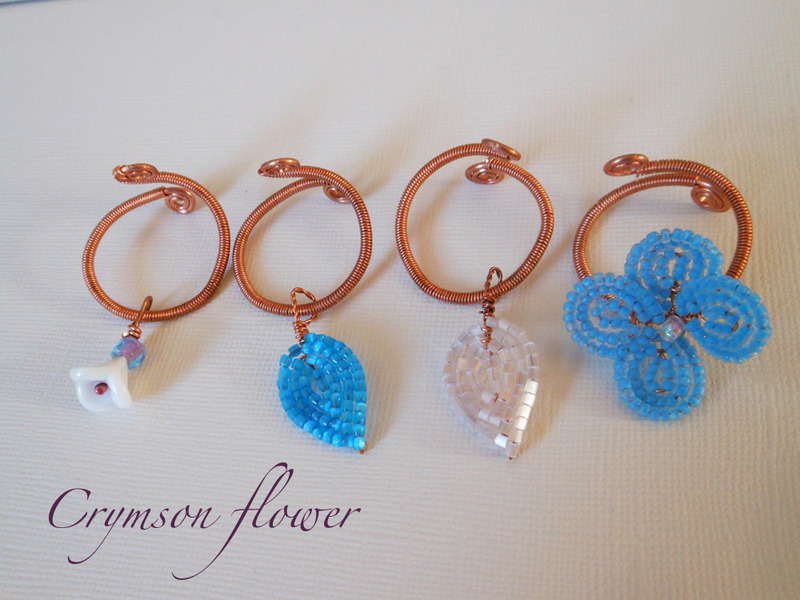 I use quality seed beads so colors will not fade. I accent flowers with gemstones, crystals, or glass beads to ensure that each flower is truly a unique piece of art. The following flower is special. 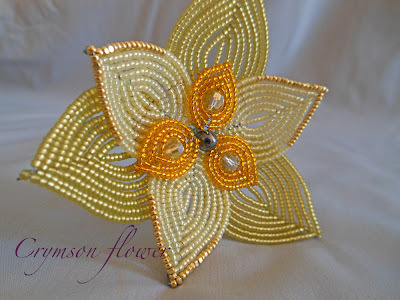 It's the first flower I made when I returned to beads a couple months ago. 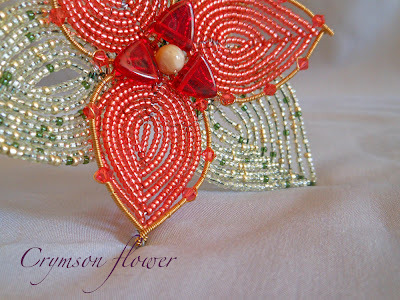 It's also the reason I started beading again and putting an emphasis in wire work. I really loved wrapping the wire and combining it with the flowers. The green petals are a mix of greens, mostly a silver lined mint green. The pink petals have brass wire wrapping accented with Swarovski crystals. And the center is made from fire polished glass beads and a mother of pearl bead. Ok I must confess when my dryer quit working this Sunday I secretly wanted it to be kaput. Well it's looking like I'm getting my secret wish and now we're going to spend the day today shopping for dryers and possibly a washer to go with it. I'm kinda excited and hesitant at the same time. Appliance shopping is exhausting. It's way more fun to go shopping on Etsy. Since I've joined I started following them on Twitter and they are always tweeting awesome finds from people's shops. There are some really cool things on Etsy. I'm finding lots of new favorite shops. Like I LOVE Whit and Whistles unique cards. And I've already had some invitations designed by RoCo. And this morning the Etsy homepage has a wonderful display of Sunshine and yellow themed products. The bright yellow really lifted me up today. So I uploaded a bunch of new wine charms to Crymson Flower this morning, to add some color and spread some winey cheer. This weekend I was busy making some wine bottle pendants. Waiting for the sun to shine again to take some picutes so I can share with all you. 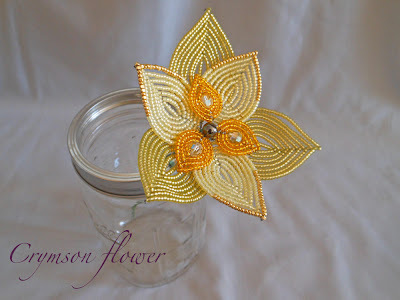 More flowers to come this week too.